Our thick, dark, not too sweet Mission Fig Balsamic Spread is a wonderful complement to the creamy goat cheese filling. In a batter pitcher mix milk, egg, flour, oil, thyme, 1/2 tsp salt, blend until smooth. Refrigerate 2-6 hours. In a crepe pan melt 1 tsp butter and tilt to coat surface over medium heat. Pour in batter, just enough to thinly cover pan. Flip when brown. Transfer and put on plate. Repeat until all crepes cooked. On a flat surface, top each crepe with cheese, fold into quarters, place on baking sheet. 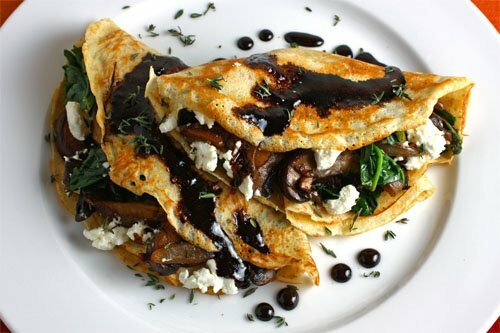 Broil crepes until brown(3-5 mins) Top with edible gardens Mission Fig Balsamic Spread and garnish with parsley. Serve and beat those Winter Blues with this true comfort food!